We all have aspects of our home décor we hold in great esteem. Simultaneously, we often also have collections that give us considerable pride of ownership. In decades past, homes sometimes incorporated wine cellars to provide optimum storage conditions for the owner’s collection. While it’s nice having a space for your wine, getting to it means a long trip up and down stairs, and if you’re entertaining, you probably don’t want to leave your guests hanging mid-conversation while you go for a wine trek. Not to mention, a lot of homeowners nowadays would want to use that space for other uses like storage or for a rec room. Fortunately, there is a perfect compromise that keeps your wine easily accessible and constantly in view. The name Renoir carries with it a promise of considerable artistry. 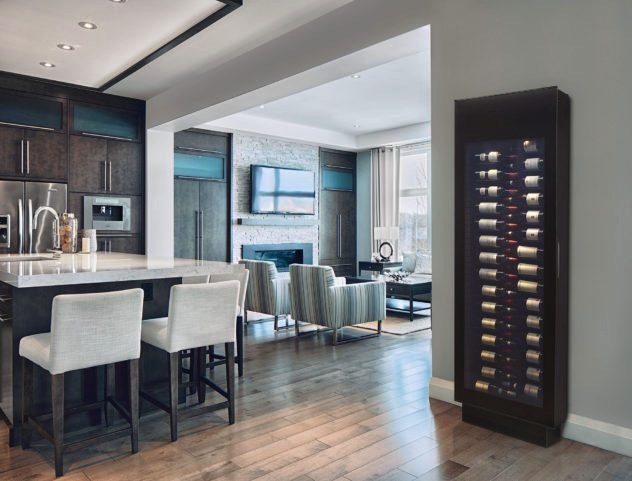 Silhouette’s Renoir Solid State Wine Display fulfills that tradition, while also providing users with the features they expect from a state of the art wine storage accessory. It can be difficult to find appliances to complement the rest of your design for the room. The Renoir is a handsome display both stark and neutral enough to fit into almost any design approach. Measuring less than 10” deep, it will mount securely to any stable wall without being overly obtrusive. The unit features a giant, seamless, triple pane low-e glass. This means that you can fully display as many as 30 bottles at once. Pocket doors discreetly mounted in the sidewalls allow for single bottle removal, further reducing the area required for the unit’s operation. One concern some might have about their wine display being in close proximity is noise. Made in North America from high quality materials, Renoir Solid State Wine Display uses the company’s Zeronext technology, which allows it to run with minimal noise and vibration. In fact, the Renoir makes less than half as much noise as most of the competition. This lack of vibration is also important to maintain the integrity of your bottles and their contents. The unit’s digital thermostat will also keep a consistent temperature that you choose between 12°C – 17°C (54F-63F.) This ensures your wine’s temperature remains stable within a quarter of a degree. The Renoir incorporates a long-life energy efficient LED light that illuminates the bottles of wine without the heat of an incandescent bulb. Some people keep their alcoholic beverages locked out of site to dissuade use by underage family members. The Renoir Solid State Wine Display allows you to display your collection with pride, without needing to worry about unauthorized access. Integrated door locks securely protect your wine behind the glass doors, meaning it is on view without providing free access. Any wine connoisseur will tell you that maintaining a precise temperature is crucial, so the Renoir also includes an alarm indicating when the door is left ajar. This promises your favorite vintage will always be at its best when your guests arrive for dinner.